A smart auto ramping intervalometer that's also a portal to your camera. Quickly setup and preview timelapse from the VIEW or your smartphone. The Holy Grail of timelapse has been the pursuit of creating near perfect transition from day to night without much post editing. The VIEW has made it possible to conquer this challenge. The VIEW can automatically ramp the exposure by analyzing the exposure value of each image and feeding it through a sophisticated algorithm to deliver perfect results for sunset, sunrise or milky-way captures. Automatic day-to-night and night-to-day or even 24 hour with no setup needed -- just press start! The holy grail of time-lapse is simpler than ever before. "The easiest to setup yet most powerful exposure ramping device I've tested to date. "Say goodbye to wasted nights of trial and error." The rugged design of the VIEW is meant for use in most conditions. It is dust proof, moisture resistant, can easily handle bad weather and even significant drops. It is designed to operate in temperatures as low as -40°C. The 15+ hour of battery life allows for uninterrupted use and and eliminates the concern of a cable disconnecting. For additional power, simply plug in external power via a micro-USB connection. The color OLED screen has a high contrast range and is comfortably usable across a wide range of ambient light conditions and temperatures. Check, reconfigure, download images, and even set-up motion from anywhere. Preview mode on the VIEW and the smartphone app allows you to see your resulting time-lapse at 30fps, even while it is still in progress. When you come back to your recording, while the VIEW is still capturing, do a gentle wave in front of the device to wake it. Without touching your setup, you can gestures to navigate to the preview to or check the current status. Another challenge with capturing time lapses is never really knowing if what has been captured is any good until you’re back at your computer. 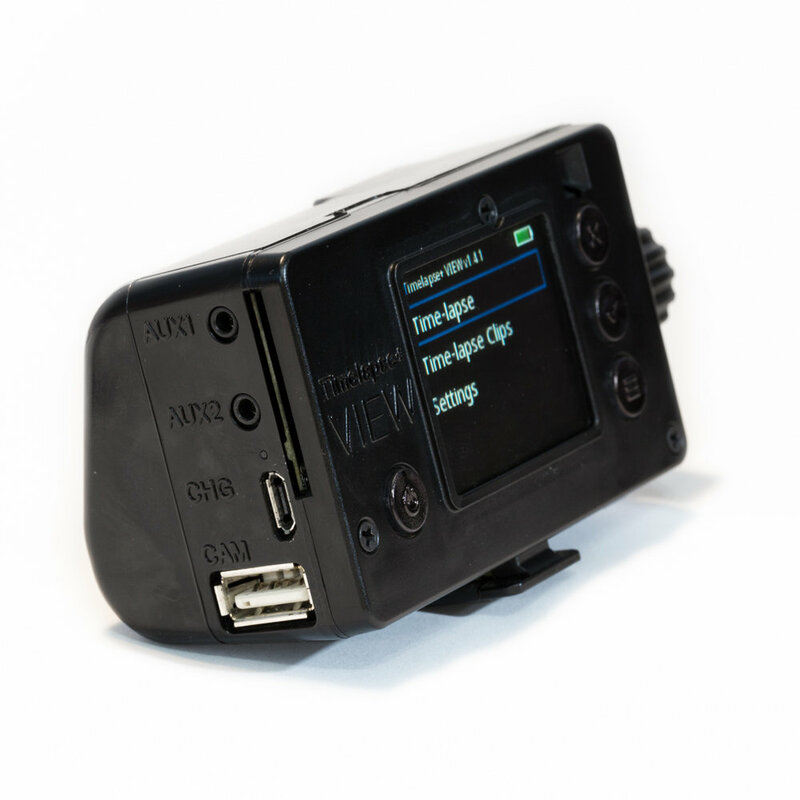 Ideal for long-term setups, the VIEW’s mobile app gives you complete control over your camera. You can preview, make settings adjustments and even download images remotely. The VIEW has an auxiliary out port for synchronizing shoot-move-shoot with most motion systems. Additionally, it can integrate with Dynamic Perceptions NMX 3-axis stepper motor controller via USB or Bluetooth for complex multi-axis multi-keyframe motion shots that can even incorporate focus ramping and dynamic variable intervals, while keeping it all in sync with the keyframes. And in addition to the user interface, the camera interface and physical setup is also simplified as much as possible. It has an integrated hotshoe mount that can read the flash sync, eliminating the need to carry extra cable. It also has a full-size USB host port for connecting the camera, so for most applications only a single USB cable is needed. For notes and issues specific to certain camera bodies, visit the documentation page section, Camera Notes.